From the main menu select "General Settings". 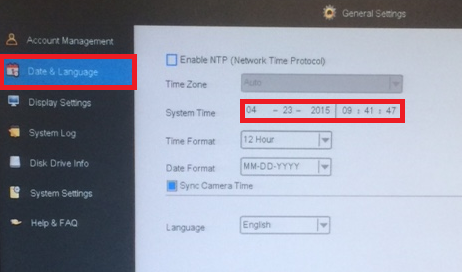 On the left side, select "Date & Language"
The "System Time" must be set in using a 24 hour clock. For AM you would use numbers from 1-12 for the hour and for PM you would use 13-23. The "time format" setting that allows you to select between the 12 and 24 hour clock only refers to the on screen display. You can also set the date and select the display format. You can choose to have the display set in different formats as month/day/year or day/month/year.